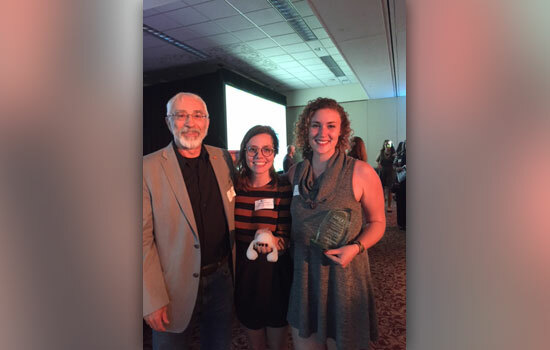 From left, Dana Wolcott, lead innovation coach for RIT’s Simone Center for Student Innovation and Entrepreneurship; Mariana Pinheiro, MFA, industrial design student from Brazil; and Erika Madison, international business student from Sodus Point, N.Y., celebrate their win in the Student Achievement category at the Digital Rochester awards Sept. 22. A team of Rochester Institute of Technology students and an RIT alumna won top awards for their innovative creations and technology leadership at the 2016 Greater Rochester Excellence and Achievements in Technology Awards, presented by Digital Rochester Inc. The ceremony was held Sept. 22. Smart Toy, founded by Erika Madison (international business, Sodus Point, N.Y.); Mariana Pinheiro (MFA, industrial design, Brazil); and Doug Huang (MFA, industrial design, Taiwan), won the Student Achievement Award, presented to a currently enrolled student or team of students at a Greater Rochester higher education institution who has shown leadership and skill in applying or advancing innovative technology for the betterment of themselves, their educational institution and/or the greater Rochester community. Smart Toy is a series of interactive instruments designed to stimulate the senses of children with low-motor coordination skills through the use of textures, sounds, vibrations and light patterns. Pinheiro hopes that youngsters with developmental and physical disabilities will soon benefit from using the educational toy she helped design. The toy has also been showcased in several student-focused entrepreneurship activities at RIT including Idea Lab, Tiger Tank, and the Effective Access Technology Conference product competition. This past summer, the design team joined the Saunders Summer Start-Up program, an intensive incubation program where students earn a stipend to advance their business ideas, as well as Studio 930, a design consultancy at RIT. Jill Eisenstein ’84 (human services management), executive director of Rochester RHIO, won the Technology Leader Award, presented to a technology business leader responsible for an IT department. It recognizes the ability for this person to instill their vision, providing the inspiration and motivation that compels an organization to take dramatic steps in applying innovative technology that resulted in increased productivity, efficiency or business success. Finalists with connections to RIT were nominated in several categories, including four in the Student Achievement Award category, one for the Rising Star award and one for the Technology Innovation Award. According to Richard DeMartino, director of RIT’s Simone Center for Student Innovation and Entrepreneurship and professor in Saunders College of Business, the presence of RIT’s projects and businesses represented at the GREAT Awards is a testament to the spirit of innovation and entrepreneurship that RIT creates and maintains.